AG Lab is a connection and cooperation between Czech engineers Ing. Zdenek Urban, Ing. Jiri Marjan, PhD. ; Technical University in Liberec and test riders. In last 6 years this cooperation became really maximally effective. We were able to bring up more than 90% of functional ideas to the assembly-line production. Specific results are structural frame solution and original suspension system Drive Link Pivot (DLP®), which has achieved a great popularity among both general cycling public and expert media. This is a system based on the four-pivot mechanism principle. 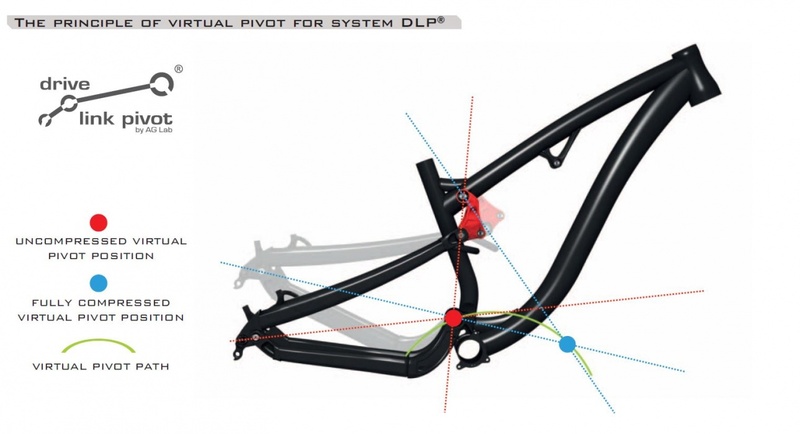 One of the major and unique ideas that were applied in the complete DLP® suspension system was placing a DLP® link (pivot – pos. L) above and in front of the rear wheel axle (rear wheel axle – pos. D). The link together with the position of the main pivot (main pivot of the rear triangle – pos. P) and the linkage geometry create a virtual pivot point path through out the travel. This path is one of the basic parameters to achieve the required suspension properties (kinematics) of the rear triangle. The DLP® system with the optimum position and shape of the linkage contributes to the overall suspension characteristics depending on the purpose of the individual model series (so-called Leverage Ratio / rear wheel suspension characteristics).